Last weekend, the club got together in Heythuysen in the Dutch province of Limburg. Autumn had definitely, but fortunately, we were still able to start with drinks outside Saturday evening. We enjoyed sampling a couple of the local Limburgs beers while catching up with each. The enevitable discussion ensued weighing the value of shirt-tucks and accessories. Our hosts, Roger and Alise Long, prepared shrimp and grits, brunswick stew, and pecan pie. The recipes were taken out of the Charleston Junior League’s cookbook so that the rich, savory meal might remind us somehow of the low country. 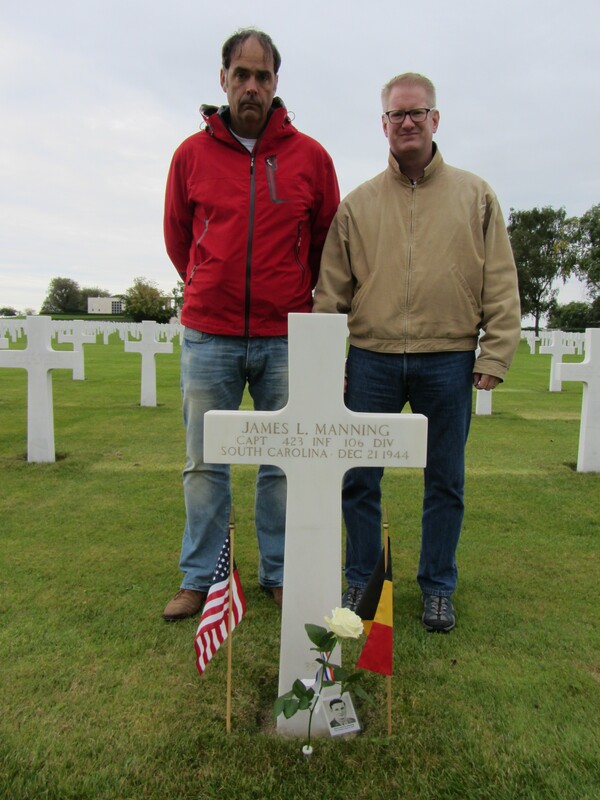 At the grave of Captain James Lawrence Manning, ’42, Henri-Chapelle American Cemetery. Sunday morning we left early to travel down south across the border into Belgium. Our first objective was the American cemetery of Henri-Chapelle. We paid our respects to the five Citadel Men interred there. After a few minutes of reflection in the cemetery’s chapel we left our fallen brothers behind and travelled a few miles back north across the border to Norbeek. There we met up with three Dutchmen who have adopted the graves of 2 Citadel Men who rest in peace at The Netherlands American Cemetery which is located in Margraten, a few miles north of Norbeek. At Café d’r Pley in Norbeek we had coffee and Limburgs “vlaai” (similar to American fruit pie) while telling our guests about The Citadel. We had a Sphinx with us so that we could show them the school and the Corps of Cadets. We then headed to Margraten to pay our respects to the eight Citadel Men interred there. Being joined by the Dutchmen who had adopted the graves of our fallen brothers was very special. They visit the adopted graves several times a year and place flowers. Margraten is unique in that all 8,301 of its buried have been adopted. The visit has made a deep and lasting impression on us. Our group photo was taken in Plot D of The Netherlands American Cemetery. Four Citadel Men rest in peace here in close proximity to each other. Our hosts from the American Battle Monuments Commission at both cemeteries were wonderful. They guided us around the cemeteries, and they had prepared for our visit by placing flags at the Citadel Men’s graves and darkening the names on their headstones with sand from Omaha Beach so they would show up well in photos. From Margraten, we headed the few miles west into the center of Maastricht, the largest Dutch city in Limburg. On the “Onze Lieve Vrouwplein”, in the shadow of the Roman Basilica, we closed out our southern adventure with a lunch of “zuurvlees” and “frites”, a very typical Maastricht meal. The BENELUX Citadel Club met on Wednesday, May 16, 2012 at Restaurant Café Mocca in Wassenaar, The Netherlands. The food and drinks were sufficient, the price acceptable, and a good time was had by all. We were reminded of how Bessinger’s BBQ out on Savannah Highway could not be beat in terms of price / quantity on a cadet’s budget. Apparently John Mahaffey ’80 spent a lot of time there back in the day. I had to admit, however, that I had made only one visit there. Having been raised on eastern style North Carolina BBQ, I just couldn’t get my head around sliced pork covered in mustard sauce. Four alumni and their families came together in Wassenaar, The Netherlands on March 17, 2012 to observe and celebrate The Citadel’s Corp Day. John Mahaffey ’80 and his wife, Sylvia, graciously hosted the get-together in their home. This was a momentous occasion for the group as it was the club’s first-ever social event. Time was spent between sharing memories of our time at The Citadel and bringing each other up to speed on what brought us to Europe and what is now keeping us here. We only began to scratch the surface after so many years away from Charleston, but we all enjoyed the catching-up as well as the opportunity to make new friends who share a real and valuable bond – The Citadel. Later in the evening, the possibility to support The Citadel in recruitment at the many American and International schools in the region was discussed. At the close of the evening, John Mahaffey handed over the club presidency to Roger Long ’89.